Something that used to be ill-advised to say too loudly in the world is that some singers could do a better job in Frank Sinatra's repertoire than Frank Sinatra. When Sinatra met Antonio Carlos Jobim on record 50 years ago, what made the record classic is that Sinatra's kind of music and Jobim's were by no means a perfect fit together. Sinatra, the ever-curious musical master with vigorously developed musical taste, had discovered in this new music called Bossa Nova, something that he'd like to explore. Which he did, classically, in the company of the music's greatest composer. 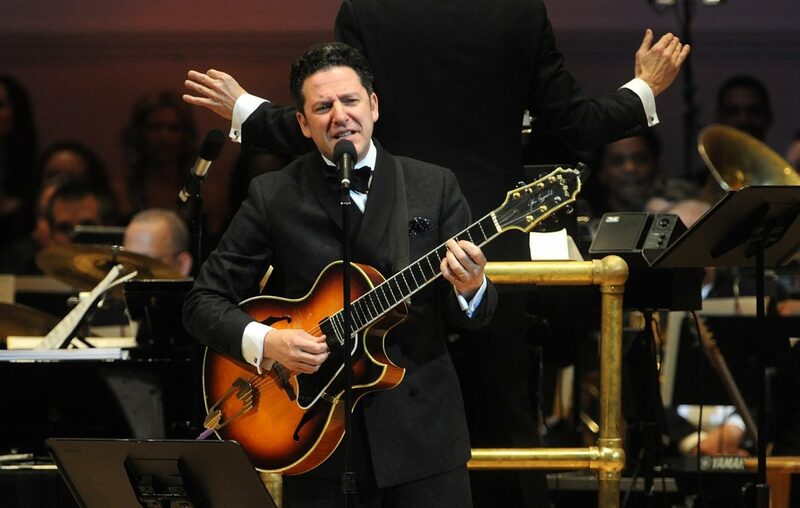 The difference here in this tribute to that music from singer/guitarist John Pizzarelli, is that he's absolutely perfect for it in every way. The soft sounds of Brazil are part of his musical birthright. His singing style and volume level and guitar-playing fit right in. What he says now is "Jobim was such a big influence on me in the 1980's--what I was hearing, then translating and what I was taking away from it." His legendary father, jazz guitarist Bucky Pizzarelli, was among those often employed for bossa nova legitmacy by jazz musicians who wanted to explore Brazilian music (would you believe Gene Ammons?) There is nothing remotely out-of-place here. This is the right musician performing the right repertoire beautifully for the right reasons.